WOOSTER, OHIO–Dr. Meagen Pollock, our mineralogist-petrologist and instrument scientist extraordinaire, should be writing this post, but she was off campus during this event. It is left to the paleontologist, of all people, to file this report. Despite my technological naïveté and more biological than chemical orientation, I quite enjoyed myself. I certainly learned a lot. 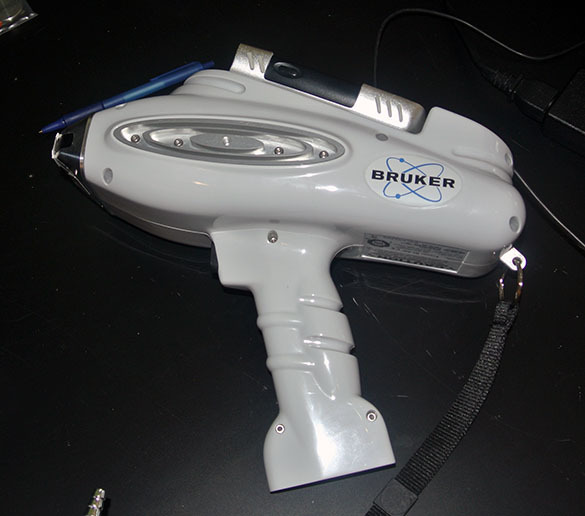 Today we had a training session to learn how to use our new Bruker Tracer III-SD portable X-Ray Fluorescence instrument (pXRF), which is shown in the above image. The resemblance to a hand phaser from Star Trek is no accident. The legend is that the inventor developed the casing directly from a Star Trek toy. The fact that it really does shoot radiation out of the front makes it über cool (and a bit more dangerous than the toy!). We have this wonderful instrument through the leadership of Dr. Melissa Schultz in the Chemistry Department and our own Meagen Pollock. They wrote a successful proposal to the Pittsburgh Conference Memorial National College Grant program for seed money, and then the Geology and Chemistry departments, along with the Dean’s Office, provided the remaining funds needed for the purchase. This handy instrument will not only be used by the geologists and chemists, but also our archaeologists and art department. This is an excellent example of the kind of collaboration possible at a small school that makes large acquisitions possible. As with all our instruments, this one is intended to further our faculty-student research programs. I’m not the one to provide a tutorial on how x-ray fluorescence (XRF) analysis works, so you have a link for the details. In short, the instrument fires a beam of x-rays through an oval window about 3-4 mm in width. The x-ray photons strike a target intended for analysis, penetrating into the very atoms with energy high enough so that some are ionized by having electrons ejected from their orbitals. When electrons from lower orbitals are removed, higher orbital electrons “fall” into their places, releasing photons (thus “fluorescence”). These photons are collected by a detector in the instrument. The energy of the photons released by the target is characteristic of the type of elements the atoms represent, thus diagnostic of composition. (Really, visit the linked page!) That we can now hold such analytical power in one hand is a scientific dream come true. This device is a superb complement to our excellent X-Ray Analysis lab in the Geology Department. Our two excellent trainers, Mike and Zach, spent the better part of a day taking us through the conceptual background for XRF analysis, safety issues, and then practical use. 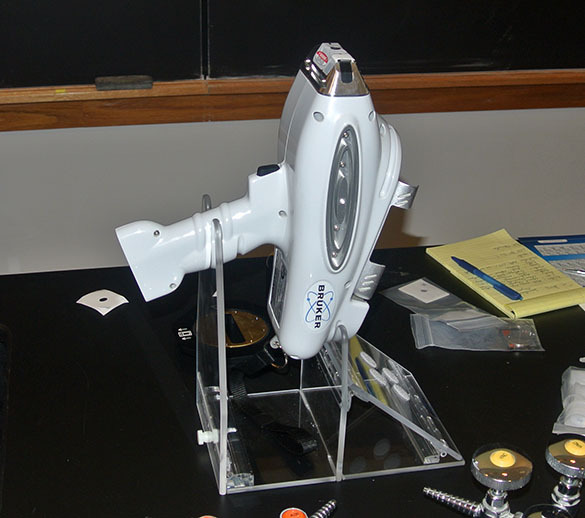 Despite the ray-gun look to the device, much of our use of it is likely to be in a lab hooked up to a laptop computer, as shown above. 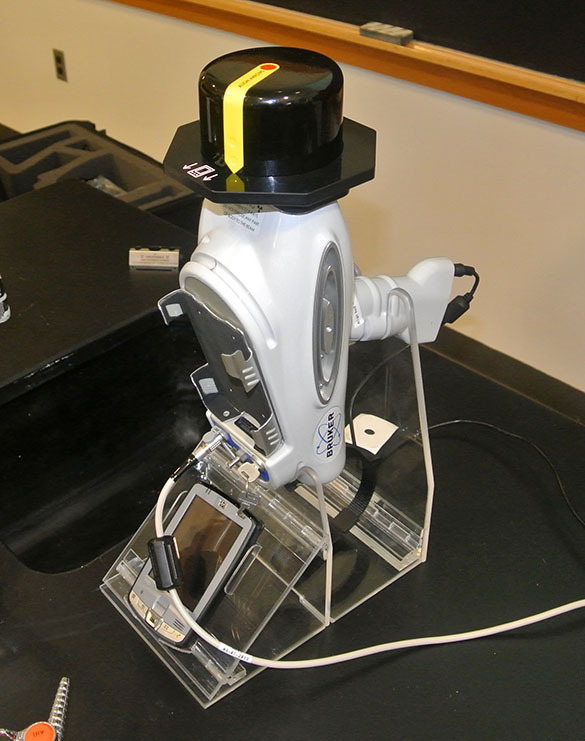 This is a very easy arrangement for doing non-invasive analyses of various small objects and liquids. We also received a complex tripod to use for scanning large items, such as paintings or other artworks. The pXRF is placed in an acrylic holder and pointed upwards. For some analyses, especially for light elements, a vacuum pump can be attached. Dr. Nick Kardulias, our senior archaeologist, provided the first and it turned out only specimen for analysis today. This is a piece of obsidian from the western United States. Obsidian is a superb target for XRF analysis because it is a glass with smooth surfaces and a complex composition. There is already a set of settings and filters available for obsidian analysis. Archaeologists (and geologists) can use chemical compositions to “fingerprint” particular obsidian deposits for provenance analysis of isolated fragments. (Provenance is the history of origin and place of an object or material.) That obsidian arrowhead in Illinois, for example, may be made of obsidian gathered in California. Above you see the obsidian being placed on the detector window. A metal cap is placed over the specimen to shield us from scattered x-rays. The radiation is not high, but we take all the precautions we can. The instrument is then controlled through the computer interface. This is an example spectrum produced by the pXRF instrument and associated software. (It is of the above obsidian sample after four runs for those of you scrutinizing the details.) The peaks represent emitted photons, and thus particular elements. 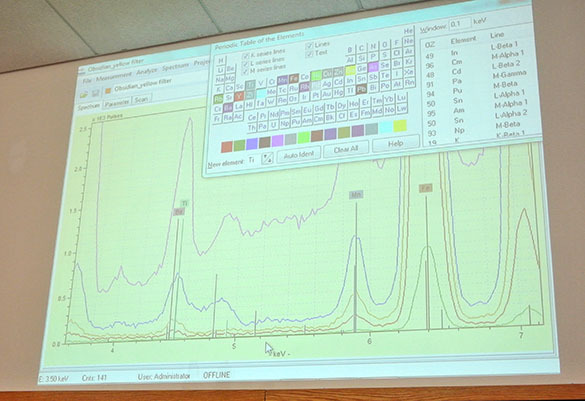 Spectral analysis here is complex, but the software has many built-in routines to ease the process. 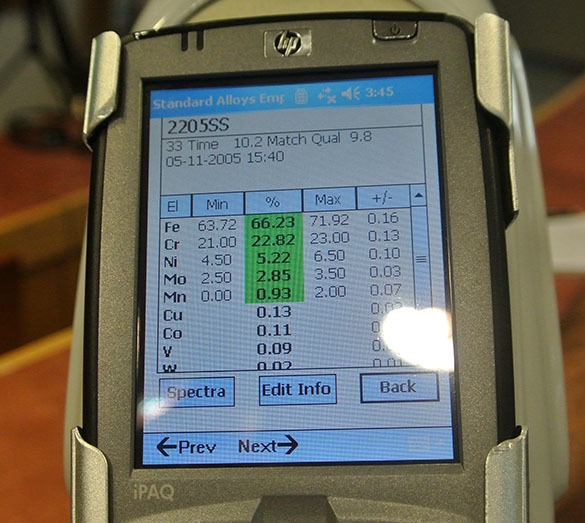 When the pXRF is hand-held and directed at a target, the data is summarized and displayed on this attached PDA screen. This is the kind of analysis I like — point and shoot! You’re looking here at data from an included standard, a piece of stainless steel, hence the high amount of iron, chromium and nickel. This is how I want to use the pXRF: in the field shooting various rocks like in the last image on this 2011 blog post by Meagen. It is nothing short of magic to get an elemental analysis of a stone in front of you in real time. Thank you again to Melissa and Meagen, as well as our leaders in the administration, for managing the purchase of this superb tool for the community! A really cool tool, but, semi-quantitative at best, unless you’re planning on homogenizing samples in the field. As with any “spot” analysis, it is susceptible to substantial variations in mineralogy/composition within short distances. 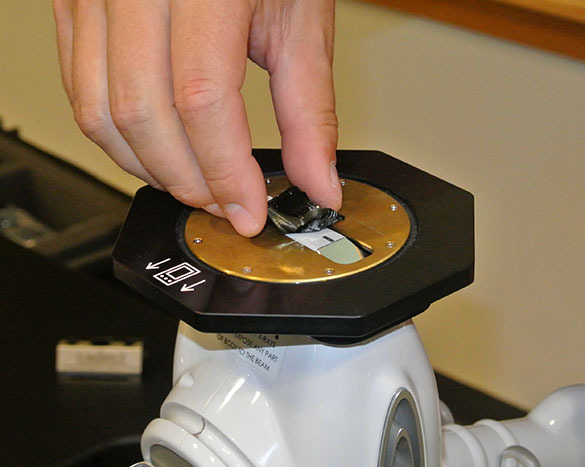 XRF is also susceptible to inaccuracies from standards that don’t match samples (like using the steel standard, above, to analyze normal rocks). Since it’s a non-destructive tool and there are vast bonding differences between, say, a metal standard and a mineral sample, those bonding differences affect the fluorescence of individual elements to some degree. However, if you have normal rock standards against which you analyze rocks in the field, you can be more assured that differences in bonding will not be affecting fluorescence. Thanks, Bill! Good advice. I couldn’t go into much detail in the post, but we do have good rock standards from our x-ray lab, along with specialized software routines for particular materials (like the obsidian in the example). The vacuum pump system is also portable, and it looks like it will be important for many of our field measurements. Nevertheless, a steep learning curve ahead of us!